Young American servicemen in Europe reading a card from home, during basic training in the U.S., but before experiencing bullets, mustard gas, shrapnel and land mines in Europe. No matter how empathetic a person may be who pauses today to remember the millions of American military forces who served in armed conflict, the experience of war can’t help but remain an abstract one. Those who’ve known what it’s like to begin a day realizing they may well be killed possess intrinsic bravery not because they fought to defend principals without fear but because they fought with it. Some of the gap between perceiving and experiencing what war is might best be narrowed not merely by remembering those who fought in one, but by seeing their faces. The faces they wore before experiencing war, while merely training for what they believed would be a glorious epoch, the heroic promise of legends and propaganda. The two faces of World War I. And the faces they wore after experiencing war, coming home without legs, arms, eyesight, hearing, sanity and even faces, forced to live with unpleasant but permanent disabilities that society quickly finds too unpleasant to ponder further. Despite all the progress humanity likes to believe it has made, war has been with us from the beginning of time. Nor has time erased two demonic truths: the pleasure of peacetime is often at risk without the defense of war, and those often most willing to send others to war have never experienced it themselves. The following photographs show both faces. The first group is mostly of men in army training camp, “practicing war,” at Fort Meade, Maryland in 1917. The second group is mostly of men sent from the battlefield to Walter Reed Hospital, Washington, D.C. in 1918. The locations were only twenty-nine miles apart, and the time between the two sets of most of the pictures being taken was about twenty months. For these men, however, the larger world they survived to return to had forever changed. Trains delivering enlistees for basic training. Learning to wash their own clothes. Playing records for some fun. Having fun with the army blankets. Tying up those boots right. Practicing shooting from inside a trench. Learning to climb out of trenches right. Enjoying a pipe on some down time. Soldier at attention, suited in equipment. The American Doughboy, ready for the Great War. With field pack secured properly. Driving through Washington, down to Union Station. The trains at Union Station will take them to the port and from there they sail to war. Eager to arrive, they were even more eager to leave. Located on the outskirts of the nation’s capital city, Walter Reed Hospital became the nation’s leading facility for treating those returning with the wounds of war, wounds that proved to be unlike any war before. The advance in machinery technology, from gunnery to tanks left a far greater number of soldiers with missing arms and legs. Most terrifying of all was the use of mustard gas and other powerful chemicals. These not only left many men with permanent breathing problems and compromised immune systems but severely scarred and burned the skin of their faces. It would prove to be the French who most readily treated the grotesque disfigurement. Opened in 1909, the facility offered what was then cutting edge care, treating the disabled, wounded, disfigured, shellshocked veterans of World War I the best chance they had of recovering even some semblance of their lives before war. Lost left hand and right leg. A blind man learning gymnastics by feel. A tea for blinded soldiers. Vets studying at Walter Reed. Blinded soldier learning to walk with a cane. A superimposed image of a soldier before and after war. A card game aboard a cruise, a man missing a leg playing a hand while a man missing an arm can only look on. A nurse pushes a disabled vet in a July 4th parade. A line of disabled vets pushed in a parade at Walter Reed for the 4th of July. Shellshocked men were purposefully engaged in anything that would keep them from falling into silent despair. Most of the permanently injured lost arms or legs Some lost all four limbs. Men missing one leg or two. Men with missing limbs submitting to nerve stimulation therapy. Many with lost limbs were simply happy to be alive. Learning to work machinery with a prosthetic arm. Learning to walk without legs. Men being trained in occupational therapy. Men cared for by nurses in the open-air porches of Walter Reed. A Native-American, “shellshocked” or what is now called post-traumatic-stress. Occupational therapy for the men included knitting. Occupational therapy included making wooden items like checkerboards. A vet suffering from mustard gas burns. 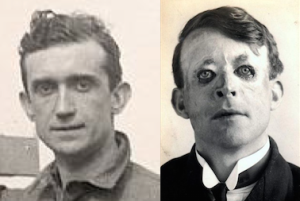 A World War I veteran, one who the French called, “the men with the broken faces.” With new chemical weapons employed by the Germans, the trauma of killing, danger, loss of limb was further worsened by permanent facial disfigurement. Whether the facial skin was burned by gas or other substance, the victim was considered lucky if he was still able to see, breath and eat. The physical pain and the emotional anguish over the disfigurement were considered secondary matters. French artists chose from a variety of plaster casted face masks to then match to features of those vets who lost part of their faces. It was the beginning of modern plastic surgery. Some of the facial prosthetic pieces used on World War I soldiers. The vet was first fitted with the partial face mask…. The artist then painted features on the mask. A close-up of one of the face masks on a war veteran. A soldier who lost his nose and lips seemingly returned to looking normal with a tin face mask. Loss of mouth and lip repaid with skin grafting and a mustache. Those lucky enough to be fitted well with face masks went on with life as best they could. Today’s civic holiday, known as Veterans Day since 1954, began in 1919 to mark the one-year anniversary of November 11, 1919. President Woodrow Wilson giving a wartime speech. That day marked the the end of fighting of what was then called “The Great War,” because the world had never experienced fighting and bloodshed on such a massive scale. It made the end of all fighting, the so-called “armistice” all the more meaningful. The world had been traumatized by this war like no other, never before having experienced death, disfigurement and destruction of human life on such a dramatic and massive scale. He made no mention of those who had not died. Yet their suffering was only just beginning. President Wilson arrives at Arlington Cemetery for a ceremony honoring the war dead. While his fight for the world to create and maintain a League of Nations as a way to prevent it from ever going through such an experience again, he was also deft in the use of words when it came to war. In 1938, the intent of Armistice Day was expanded to include “a day to be dedicated to the cause of world peace.” That intent didn’t last long. Weeks presents his proposal for a National Veterans Day to General Eisenhower. It took the power of a man who’d actually fought in wars to shift the emphasis of November 11 from a day dedicated to not just those Americans who died but survived and those who fought not just in World War I but all wars. In 1945, when World War II veteran Raymond Weeks first approached General Dwight D. Eisenhower, supreme commander of the Allied Forces, with the idea of a National Veterans Day, he found an ally. A young President Eisenhower – as a serviceman of the Great War. In 1954, one year after becoming President of the United States, Eisenhower signed the law establishing November 11 as Veterans Day. War. It is perhaps so traumatic that by the time a generation that has carried the brunt of it has begun to fade, a newer generation is always all too eager to take on the challenge. Not long after the Armistice, an army sergeant returned to the battlefield where he’d experienced the most horrific violence and had been left with the most haunting memories. The earth was littered with not only broken rifles, but the remains of human beings. As the daughter of a WWII hero*, I thank you for paying tribute to our soldiers. Those were very powerful pictures, and they spoke more than a billion words! I have to admit, I could not get to the last one, because they were so painful to look at/process. *My father was a WWII Ghost Soldier of the Phillipians.. He survived the brutal March to Batan, only to be crated off to a Japanese POW camp for 2+ years. When I recall McCain running for President, partially on the merits of being a Vietnam POW, I shake my head in the negative. I would hear about this Senator’s volatile temperament, and it sounded too close to home. You don’t come out of these experiences being “Mr. Nice” guy. There is a terrible price for post traumatic stress, some are rehabbed better than others. And if the honey had been rancid, I’m sure he would have blamed the government! How wonderful, wonderful to hear from you S! Sorry for the delayed response- I only just realized that all reader comments were getting lost in the spam trapper and those from before 15 days have been lost. Big Boo. But onward….Every one of these men was a hero – and every person who sees what this earlier generation saw is also a hero. Unfortunately, sometimes the heroes are left maimed and scarred, inside or outside, but we must not turn our attention away from them – and yet, the government has never seemed to do right by what is promised those who sacrifice their lives for a set of values. Very powerful – yet so easily overlooked. Thank you Jim (and Mr. Coolidge). I felt it was important for people to see. By the way sorry for the delayed posting – I only just realized that all reader comments were getting lost in the spam trapper and those from before 15 days have been lost. But we caught yours!